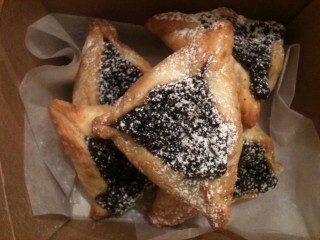 Have you ever had a hamantaschen? Here's the one to try: marscapone dough with a boozy blueberry filling. What? You’ve never had a hamantasch? Don’t worry. Until this week, I would’ve said to consider yourself lucky. Purim’s traditional triangular cookies are not what I’d call one of the Jewish culture’s culinary highlights. They often consist of thick, bland dough and a cloyingly sweet gummy fruit filling. It’s the kind of thing you eat purely out of a sense of childhood nostalgia. Kids get to dress up in costumes for their annual Purim carnival (what one friend calls Jewish Halloween), all part of the retelling of the Peach story featuring a villain named Haman. Joan Nathan, the authority on Jewish food, says Hamantaschen most likely originated in Bohemia, in what is now the Czech Republic, just two or three centuries ago. This year Purim ended on Sunday evening but, due to popular demand, baker Yoav D’vaja, the owner of Bread & Sons, will continue to make his tasty twist on hamantaschen at the bakery. Jewish or not, it seems everyone who tastes them comes back for more. One bite and I could understand why. I was able to convince D’Vaja to share some of the secrets to his truly delicious triangular treats. The dough is based on his mother’s recipe, one she used to make another cookie altogether. He loved the combination of butter and mascarpone cheese that gives it an incredible tangy, buttery flavour. He makes the dough thin and delicate so it melts away on the tongue. As for the filling inside the three-corner cookie — which represents either Haman’s hat or his ears, depending on which version of the story you hear — it deviates from the traditional prune and poppy or fruit preserves filling and instead uses a mix of blueberries that are soaked in a bit of Brandy. The heady jam includes cassis liqueur, fresh vanilla bean, honey and plenty of poppy seeds that provide a slight graininess and, best of all, an unexpected and inexplicably exotic edge. It’s a perfect partner for Bread & Sons’ brilliant cup of coffee. D’Vaja says he’ll keep making them until Friday. But with enough requests from customers, I wouldn’t be surprised if he just keeps making them. Isn’t that how new traditions get started? Bread & Sons, 195 Bank St., 613-230-5302.